HomeAstrologyDon’t Mess with Spirit – They’re on Facebook Too! Can Spirit contact us through social media? I think so! As many of you know, my friend Butterfly passed away last month. Soon after her death, she sent a Kookaburra as a sign of love for us. Interestingly, my post about this bird totem stirred up mixed feelings on social media and among my friends. One person, whom I’ve known for almost 10 years, called to say he was sceptical about the Kookaburra – perhaps my emotions had made me too subjective? I appreciated his feedback, as I had also doubted bird signs in the past (until the Kookaburra moment). Guess what happened next? After my friend hung up, he checked his facebook account and saw the photo below (from an article by the Courier-Mail about Regan Grieve). Below it, was a video of a peacock, which has great significance to his family (see below). Regan was a young football star, who sadly suicided in 2015. In numerology, his name has a 66/12/3 vibration, the same as TRANSFORMATION. So his career (how he ‘made a name’) was about opening minds and teaching love. See my thoughts on 666 numerology. 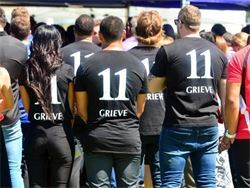 As you can see, the photo shows my lucky number 11 (I am a Master 11 lifepath in numerology) with the word Grieve underneath. Find your lifepath here. 11 is the number of the Spiritual Messenger – someone who brings divided people together for a common cause. Seeing a photo of11:11 just after talking to me about death was a sign even my friend couldn’t ignore. In regards to the peacock – my friend’s Mum used to keep a peacock and peahens. After she died, a peahen appeared at my friend’s home and would stand at the glass door, watching his Dad. Not just once – it visited for a few years. Although his family are Christian and don’t believe in spirits, they fed the bird, even when it pooed all over their doorstep. My friend found this experience emotional. It seemed like a message from his Mum. I was touched that my friend told me what happened next. He could have kept it to himself, and I would have kept doubting my Kookaburra experience in the back of my mind. By sharing his story, we both had a chuckle at Spirit and each other. It’s nice to know that Angels are always listening. Apart from my friend, another guy also teased me on facebook – he implied I was crazy and should ‘share my medicine’. He said that Kookaburras visit his daughter but that doesn’t mean anything. Geeez. After reading his comment, I sat down and wrote 99 examples where Spirit had shown up in my life (see some of the miracles here). This process helped me to calm down, but I still felt sad – it sounds like his little daughter is psychic but will have to discover this for herself. When I checked facebook again, he had deleted our conversation and un-liked my page The Numbers Queen. Ah, well, you win some, you lose some! That’s why they say ‘those who matter, don’t mind and those who mind, don’t matter’. No kidding – after I published this blog, someone contacted me saying that they’d lost someone recently, who had loved the numbers 11 and 33. They were startled by the picture above, as the word GRIEVE was also relevant to them. It’s amazing how interconnected we all are. Conscious Wisdom Podcast – Are You Psychic? Past Lives, Ghosts, Crystal Healing & More! Or, for greater clarity, book a phone or Skype reading with me to discover your soul contract and 2016 forecast. My current waiting list is 6+ weeks for new clients. It’s worth the suspense – see previous clients’ feedback. I also teach numerology workshops in Brisbaneand palmistry.